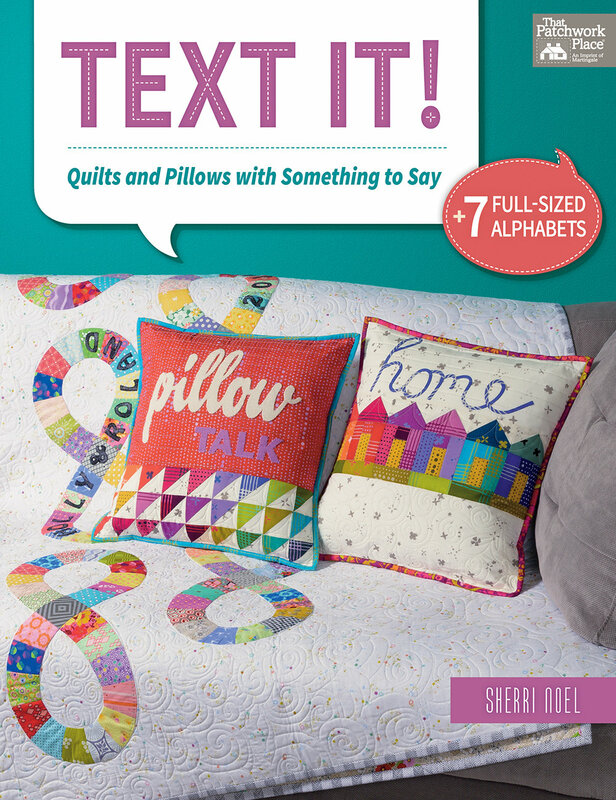 My friend Sherri Noel has just published a new book, "Text It". Sherri and I have been in the same quilt guild for years and have so much in common as quilt designers. When she asked me to make a quilt from her new book and blog about it, I knew I was going to make the "1 Sheep" quilt! After reading all about "Counting Sheep", tell me the one thing that helps you relax before bed in a comment below to enter the give-away! Tag a friend in the comment for an extra chance to win! Martingale has generously given me one "Text It" book to give away and I'll also give away a set of my "Hearts & More" tools so you can try making circles my way! Sherri's adorable little sheep is so darling! I knew that I could get this quilt done in time for the "Hop" because it is all made of circles. I jumped right in with my Hearts & More templates, the perfect tool for cutting perfect circles! There were a few fabrics at my Local Quilt Shop (Franklin Mill for all you local girls!) with sheep on them, and a fun border print that reminded me of wooly sheep in white and gray. To keep the quilt soft enough for a baby, I chose Mistyfuse brand fusible web to fuse my sheep and the words. It is so soft you won't even know it is there! After putting the fusible on the fabric with an applique pressing sheet, it was time to cut all those circles! Here is a link to my video for putting the mistyfuse on your fabric. I used the Hearts and More large template set to cut 2", 3" and 4" circles using my rotary cutter. No tracing, no scissors, no fuss! Sherri's circles weren't exactly the same sizes as mine, but I don't think it matters! A Design Wall covered in Kaffe Flannel is the perfect place to start laying out the pieces. I have a Youtube video for that too, if you want to make a design wall for yourself. Since Sherri had already reversed the alphabet, I traced the reversed letters on to parchment paper (from the grocery store) and ironed the parchment to the mistyfused fabric. Since I'm over 50, my Daylight Magnifying Lamp is the perfect thing for cutting out applique and sewing on my machine! I decided to spell out the words "One Sheep" instead of using the number one. To center the words on the background fabric I used a ruler and my Iron-off Chalk. Since I am fusing the words, the Iron-off chalk is the perfect marking method! After fusing, all the marking is gone with the heat of the iron. I opted to omit the pieced border since I had the perfect puffy stripe border instead. Of course a striped border calls for mitering, so that was the final step in making the top. Here is the finished top with the strip border. Isn't this little guy awfully sweet? I have been traveling for a bit now, so I haven't had the chance to stitch the applique down yet. When I do, I will buttonhole stitch the fused applique shapes with a buttonhole stitch on my sewing machine...or maybe I will play with stitches until I find one that looks soft and fluffy. I hope you enjoy my version of Sherri's "
1 Sheep" quilt from "Text It!". If you would like your own copy of the book, leave a comment below and maybe you will win a copy! Or follow the links below to purchase the book on Sherri's website, or on Amazon. You can read about more projects from this fun book by following the blog hop line up below. You’ll get to see each quilt design made different ways and with different fabrics, you may find some fabric giveaways along the way too!! I focus on the rolling waves on a beach, in order to sleep! Works every time! The book looks great, love your sheep! Ahhhh, the beach! The sound of waves puts me right to sleep too! I read and have a cup of tea before I fall asleep. I like to read for a bit before bed. It always seems to relax me. Love your interpretation of Sheri's quilt. The fabrics are perfect. I listen to my books instead of reading. I'm asleep in minutes! What a awesome pattern in your book! One Sheep, it’s a must have book!!! I agree, Laura. Sherri's book is full of fun patterns! Jealous! It takes me a while to fall asleep. I'm always dreaming up new patterns! It's great to see your version of the sheep, as I made it for the bloghop too. Perfect sheep-like fabrics! And I LOVE your version! So darling, isn't it? Thanks, Sherri for the great pattern! Your version is adorable, and I look forward to learning more about your templates. My sleepy time routine is reading a good book. Funny! Thinking up quilt ideas actually keeps me awake at night!! Thanks for tagging your friend. Two chances to win. Woot Woot! How fun that you had actual sheep fabric to make your sheep! I like to read before falling asleep. It doesn't seem to bother me if it's on my iPad or a real book. Praying and or thinking about bible verses I’ve memorized helps relax and sleep. Love the one sheep baby quilt. What a peaceful, relaxing way to fall asleep. Send up a prayer for me...I am worried about a loved one. Thanks in advance! I fall asleep by doing a repetitive breathing technique. I breath in for 4 beats, ho,d for 8, and the. Exhale over 7 beats. Then repeat and repeat. Yes! I do that too, learned it from my yoga instructor. Oh, I can imagine! I only worked 3rd shift for a month when I was working in a Textile Printing Factory. That was HARD! I never did get used to it. I either read or stitch before I fall asleep. I need to start and hand project so I can stitch. That would be a good routine! Productive and restful. If I read a real book, I can't put it down! I've been known to ready until 2 or 3 in the morning! I always have such difficulty falling asleep (likely because I cannot get my brain to turn off), but this design is adorable! The more I see of this book, the more I want my own copy. You can send me an email to confirm my win at fishingquilter@gmail.com. Thanks for the opportunity to win a copy! I have the same issue. Try some deep breathing exercises. They really work! I listen to CBC radio. The interviews are interesting and voices calm. That's a great idea. I'll have to try it! Love the fabrics you used in your sheep. I often fall asleep watching tv. Thank you! The fabrics were a great find. Thank you! I love this little sheep. Thanks to Sherri for such a great book! I fall asleep by focusing on clearing my mind and picturing the Rocky Mountains. Thanks! Sounds like a beautiful focus! I read every night before going to sleep. Me too. But I listen to books instead of reading! I have had chamomile before to try to sleep. Thank you.